This summer, there were numerous sightings of sharks at Cape Cod, not too far from where I have vacationed for the last three years. 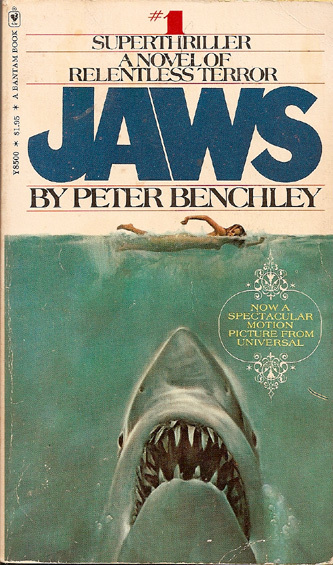 Since the water in Massachusetts is far too cold for my Caribbean blood, I thought I would get in the spirit of the season by reading a book to keep me out of the water: Jaws by Peter Benchley. I’ll start by saying: I liked it, but in this instance, the movie was better. Maybe it’s because I grew up on an island. Maybe it’s because I’ve seen the movie so may times. Whatever the reason, the book didn’t scare me like the movie did. The movie really kept me out of the water for a while – everything seemed like a real danger! The book just didn’t do it for me. But for the $1.50 I spent on it, it was worth it. There’s quite a bit that was trimmed out of the movie, which I thought was a smart choice. The book dealt with infidelity and mobster business… ALL of which I thought took away from the central purpose of the book: A giant man-eating shark. Yes, it’s interesting to read a bit more about the characters… have them a bit more fleshed out… but so much of the book was boring and drawn out. I found myself speeding through pages simply to get to the more exciting shark scenes. Yes, it’s interesting that the mayor of the town was threatened by the mob to keep the beaches open for money, but at the end of the day… I don’t care. Spielberg did a fine job of adapting the book to the screen. Many of the scenes were spot on with the book. Towards the end when the three men go out into the water to search for the fish, the movie created at atmosphere of camaraderie between the characters during a long overnight expedition. In the book, the men went chumming through the water and returned to shore at the end of each day. I didn’t have much sympathy for the characters in the book… in fact; I was rooting for the shark in some places. From what I’ve gathered from reading about other Benchley books… This was the most successful. The rest of the books were flops. I think the book happened to come out at the right time and Spielberg struck while the iron was hot and turned an interesting concept into a fantastic blockbuster film. So, farewell and adieu to the writings of Peter Benchley. I’ll drink to your leg, Steven Spielberg.